"If companies can open themselves up to contributions from enthusiastic customers and partners, that should help them create products and services faster, with fewer duds -- and at far lower cost, with far less risk." This is what BusinessWeek writes in a long and well documented essay entitled "The Power of Us" that will be part of its next print issue, dated June 20th. "At the same time, peer power presents difficult challenges for anyone invested in the status quo. Corporations, those citadels of command-and-control, may be in for the biggest jolt. Increasingly, they will have to contend with ad hoc groups of customers who have the power to join forces online to get what they want. Indeed, customers are creating what they want themselves -- designing their own software with colleagues, for instance, and declaring their opinions via blogs instead of waiting for newspapers to print their letters." It is a number of new technologies, that have appeared only in the last few years that has given fuel to this increasing cooperation. P2P file-sharing, blogs, RSS, wikis, recommendations and affinity engines like the ones utilized by Amazon, grassroots news efforts like OhMyNews in Korea, millions of user-generated ratings and reputations like on eBay, collaboratively classified and selected resources like on del.icio.us or images as on Flickr. No less amazing is the collaborative distribution potential offered by BitTorrent, a new P2P protocol allowing huge-sized files to be distributed easily at basically zero-cost, or Skype, a free software tool that allows anyone to bypass the traditional telephone system. Of all these, probably the most startling example of successful cooperation is Wikipedia. Nearly five million people visit this online grassroots-created encyclopedia at least once a month, which counts more than 1.5 million entries in 200 languages created by individual unpaid volunteer (compare this to the Encyclopedia Britannica's mere 120,000 entries to get an idea of the size). But what is that sets these new technologies apart from those of the Internet's first generation tools, namely static Web pages and email? These technologies leverage the pervasive interconnectedness of the web to create social value that neither e-mail nor traditional Web sites provided. What sets these new technologies apart from those of the Internet's first generation is the fact that they perform a unique a role: they provide a useful facility to the interests of the individual while creating automatic value for everyone else. The turn self-interest into social benefit, and at times even into real economic value. The choices we make, as a society, are greatly connected to the technological context we live in. In the Middle Ages we would have not based our economic system on the principles of mass production, marketing and distribution, as the socio-economic and technological context didn't provide the premises for such a change. But what we do need to ask is: are the technological opportunities in the era of digital information economies the same as the ones that dictated the socio-economic systems we are in? Has the socio-technological context changed so radically that we should be looking at economic and production systems that leverage, instead of resisting, the opportunities offered by the new eco-techno-system we live in? What a Yale professor suggests is that a growing body of literature on social norms, social capital, common property regimes, and the emergence of peer production, outline the contours of social sharing as a third mode of organizing economic production, alongside markets and the state. "The characteristics of information--be it software, text or even biotech research--make it an economically obvious thing to share. It is a "non-rival" good: ie, your use of it does not interfere with my use. Better still, there are network effects: the more people who use it, the more useful it is to any individual user. Best of all, the existence of the internet means that the costs of sharing are remarkably low. The cost of distribution is negligible, and co-ordination is easy because people can easily find others with similar goals and can contribute when convenient." Yochai Benkler, Professor of Law at Yale, focuses on these very issues, and in a challenging essay entitled "Sharing Nicely: On Shareable Goods and Emergence of Sharing as a Modality of Economic Production" brings forward the rationale supporting the fact that sharing economies are part of our near future. "New research indicates that cooperation, often organized from the bottom up, plays a much greater role than we thought in everything from natural phenomena like ant colonies to human institutions such as markets and cities. It's what New Yorker writer James Surowiecki, in his illuminating 2004 book of the same name, calls "The Wisdom of Crowds". Crowds can go mad, of course, but by and large, it turns out, they're smarter at solving many problems than even the brightest individuals." The economies of participation are well reflected also in the fascinating work I am carrying forward with Ken Thompson of bioteams.com. Thanks to his vision and research experience he has been able to draw great parallels between the cooperative and highly self-coordinating activities of living beings and what it is required by today virtual business networked teams to become as effective as their nature counterparts. Together with Ken, I have published a Manifesto about bioteams and the importance of learning from living groups who have been very successful at survival over the arc of millions of years. But the economies of participation can provide huge competitive advantage also in areas from research and development to marketing. Letting users, customers, participate and provide input during the development stages of a new product is now well known to be a superior way to achieve good results in a shorter time frame. Even at Microsoft you can start smelling the flavor of participatory culture. The Microsoft Search Champs program, though reserved to a restricted elite of technology enthusiasts, is one open bold approach to start listening more, and more closely to the user-base. Though my comment may appear diplomatic at best, it stems from having seen first hand Microsoft listening and changing things as a consequence of the Champs contributions. That rocks. If you want another example of Microsoft opening eyes and ears to something that grows from their user preferences rather than from their finance department, look no further than Microsoft Start. This is a hell of a revolutionary change from Microsoft and one in which they are all out to listen and make something truly user-driven. I have complimented Microsoft on this project in person and I still see it as one of its strongest ammunitions to revamp, connect and remodel its online product marketing approach. But the approach to participatory and cooperative production and distribution it is not restricted to the software development field or to Web-related services. Hollywood, mass media television and the future world of Internet and digital television are all deeply affected by these very same trends. As the long tail of movies begins to find ways to be accessed on the web, a new army of independent producers and videomakers will set itself free from the highly restrictive and unmeritocratic system provided by traditional film festivals and distribution houses. "People are not only sharing songs and movies -- legally or not -- but also creating content themselves and building sizable audiences." 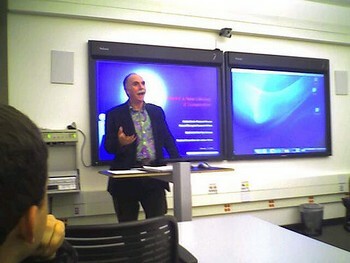 The prestigious Stanford University in the US has awoken to this sweeping phenomenon and has recently run a course, headed by cyberparticipatory guru Howard Rheingold (the author of Smartmobs), on the issue of effective cooperation. A good number of videos of this course classes, which has hosted, among others Peter Kollock, UCLA & author of Communities in Cyberspace & "Social Dilemmas", Peter Corning, Director of the Institute for the Study of Complex Systems and Steven Weber, Director of the Institute of International Studies and Professor of Political Science at UC Berkeley are all accessible from this page. "Our work shows how quickly a traditional proprietary product can be overtaken by an open alternative. That doesn't mean that we won't destroy their business".